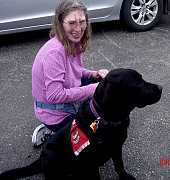 Sponsor a Service or Hearing dog and help someone regain their independence! Make a donation to the team of your choice. Receive a picture of the team and get updates to his training. Have visits to your organization with demonstrations on his progress. Know your donation are being used for the care, training and health of you sponsor dog. Help us, help someone get a helping paw.